"To create an engaging and exciting comprehensive music journey that is based on a high respect for what we do and who we are as an ensemble, high standards of musical excellence and knowledge, and self-assessment. The result will be an ensemble of students who rehearse and perform to their absolute best because they realize and desire to perform to their impressive potential." 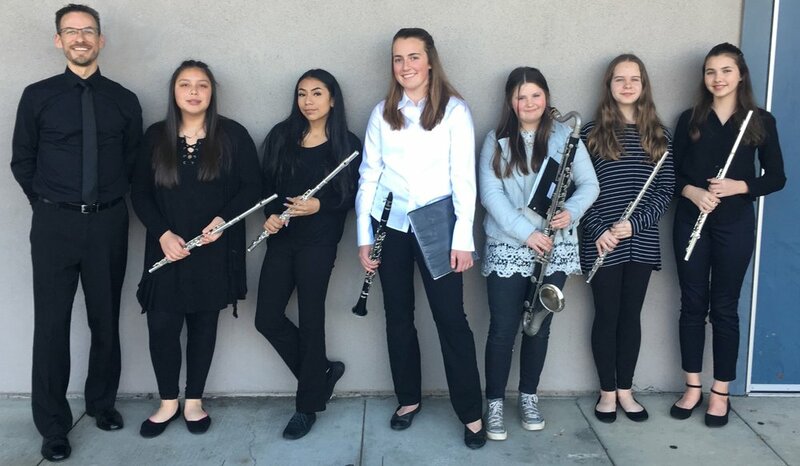 Congratulations to 8th Grade Honor Band participants Kate Austin, Kaira Mora, Sheyla Sanchez, Alexis Zynda, Shelby Perez Bowen, and Kati Williams for your outstanding performance during last night’s 2019 Lake/Mendocino County Honor Band Concert! You all rose to an occasion in which you should take great pride only as a result of your hard work over the years! Words cannot express how proud I am of each one of you. I am looking forward to the quality of musicianship that you will bring to our band rehearsals from now until June. Keep up your fine work, musicians! Our BGMS Winter Concert was a great success! Our 6th Grade Band followed by our 7th Grade Band performed selections from our method book with a beautiful, rich concert band sound. Our 8th Grade Band followed and performed three pieces. Their first piece was our first time performing a jazz-like piece, adding the beginnings of a rhythm section: a drum set & 3 jazz guitarists from 7th Grade guitar class. Their next piece was slower, more reflective, and consisted of only 8th Grade Band members. For our final piece, Avalon, we added auditioned 7th Grade Band students to the 8th Grade Band to form a 26-member advanced band that sounded absolutely amazing! Thank you to everyone who attended our concert. Your support is what makes our BGMS Music Program thrive. And congratulations to all Musicians. I am extremely proud of your performance, and I am looking forward to our next performance together! Our BGMS 8th Grade Band/WHS Band combined performances as the Willits Pep Band for the WHS Varsity Home Games have been a huge success! We had a total of 27 students (10 BGMS & 17 WHS) during our first performance, which formed the largest pep band to play at a game in over 5 years! Our BGMS students are already forming positive relationships with the high school students, while having a more active musical presence in our community. We continue to receive praise from community members, parents, and staff about how great it is to have more students playing with a bigger sound at the games. Our last home game will be on Friday, October 19th. See you there! During these past two years of teaching music in the Willits Unified School District, I have learned about our BGMS Music Program’s needs and how those needs tie into our community. Over the past year, I have worked on developing a vision for our music program and have sought to make the necessary connections with community members that will contribute to our BGMS Music Program’s success. This year, it is time to take all of that planning and start running with the vision I have for our school’s Music Program. And this, is when it gets really exciting! Here are the exciting events that I am adding to our BGMS Band Program this year. As you can see, this is going to be a very fun and exciting year. I am looking forward to working with you and your young musicians! Let's have an AMAZING year!